Poor Fergie can’t catch a break. 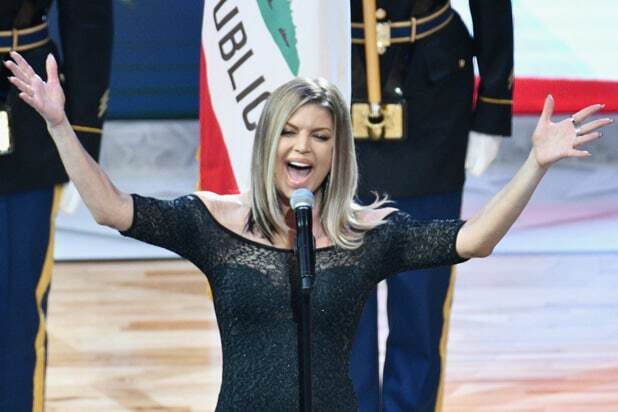 The singer’s much-maligned national anthem performance at the NBA All-Star Game earlier this year is once again drawing laughs, with the Golden State Warriors dancing and chuckling to a new remix of Fergie’s performance — and it was all captured on Steph Curry’s Instagram Friday night. The Warriors are clearly responding to Fergie’s ex-husband, Josh Duhamel, calling forward Draymond Green a “prick” during an interview Thursday. Duhamel recalled Green being caught on camera letting out a wry smile and laughing at the All-Star Game in February as Fergie wrapped up the anthem. Duhamel, in an interview with Fox Sports’ Kristine Leahy, said if Green was a “real man” he would’ve called Fergie to apologize. Green, in response, joined several teammates — including Curry, Kevin Durant and DeMarcus Cousins — in clowning Fergie’s performance once again in the locker room skit. The beef appears to be dead, however. Duhamel tweeted Friday night “note to self: Think twice before you call out the champs. Well played @Warriors #NBATwitterisnojoke.” Green followed up, responding “Hahaha it was never any disrespect to her… But the challenge about to be lit G!” Seems like everyone is back to being friends.